How can you not love when everything comes together on the autumn wedding day – the weather, the colors, the couple and amazing guests! This is what Helen and Alar experienced when they were ready for everything that October in Estonia can throw at them but ended up with the autumn magic that even the most beautiful summer can’t beat! Innar shot our wedding video in 2017 October. When we saw his work while shopping for a video artist, we knew right away he’s our man for the job. 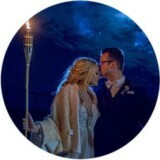 Innar just has this romantic, warm, colorful and magical style, mixed with great music and our wedding vows, complimenting the dreamy flow of the video itself. Innar has a lot of creative ideas on how to get the best shots and while being an outgoing person it is really easy to work with him, despite my camera shines. Would add more than 5 stars for his effort. Big thanks and keep up the good work!